My Honest Review of the Whole 30 — The Nourishing Soul Co.
Four weeks ago I made the decision to try the whole 30. You might think I’m a crazy person for cutting out added sugar and processed foods from my diet for 30 days. You might also think it’s impossible—especially with the world we live in. But it’s not. It is challenging but so worth it. Taking on the whole 30 has helped me grow as nutrition professional and realize the importance of making your own assessment when it comes to research and what is typically recommended by the government and other big names in nutrition. This may be a controversial topic for those of you studying nutrition or already in the field practicing, but hear me out… yeah? If you’re not familiar with what the whole 30 is, let me acquaint you. It’s a 30-day commitment to eating real whole foods. No processed foods, added sugars, alcohol, legumes, grains, or dairy. If you follow me on Instagram you’ve probably seen some of my anti-diet posts. When I started learning about the intuitive eating approach last year in my nutrition program I embraced the concept that truly living a healthy lifestyle meant eating balanced void of dieting. I’ve dieted in the past by cutting out food groups, using diet pills, fat burners, you name it—all for the sake of looking good while feeling miserable. So when I stumbled upon intuitive eating I finally felt free from dieting and at home with an approach that I believed in 100%. With my anti-diet mindset and belief that the whole 30 was a diet, I continued to over look it and use it as one of my excuses to not try it. I was interested in the whole 30 mainly because I wanted to change the way I was eating. I realized I usually stick to the same foods and recipes and was honestly getting bored. On top of all that, I wanted to kick my health up a notch, minimize my caffeine dependency, and naturally detox. So needless to say, I started to slowly change my mind. Because when did eating natural whole food, the way nature intended—become classified as a diet? Once I got past that mental roadblock and decided to give it a go, I started learning the nitty gritty science about why foods like whole grains, peanuts, and dairy aren’t allowed and what they do to our body. The book, “It Starts with Food,” helped me connect the dots and understand the program. If you’re thinking about starting the whole 30 or maybe you’re a nutrition professional with your own doubts about it—read the book and from there decide how you want to take the information laid out for you. As a nutrition student, this book has seriously changed my perception on the dietary food groups we eat. Another reason why I was anti-whole 30 was because it didn’t allow certain carbs. Especially the ones I’ve learned to be so beneficial to the body like quinoa, brown rice, and other whole grains. How could healthy whole grain carbs not be allowed? But like I mentioned, the book breaks it down so you understand why your beloved cereal or toast are not going to journey with you for the next 30 days. So without whole grain carbs and my favorite morning staple, oatmeal, I had to find other alternatives. My carbs now come in the form of sweet potatoes, red potatoes, or fruit. 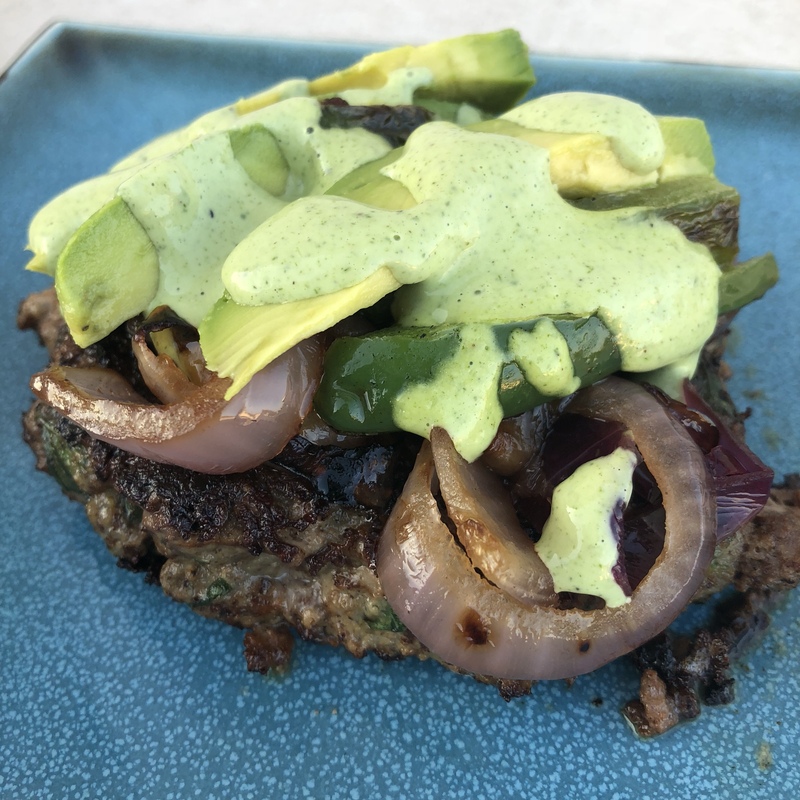 My plate is always full of protein like beef, chicken, or pork, vegetables, and at least 2 servings of fat in the form of oil, ghee, nuts, avocado, or almond butter. From an intuitive eating standpoint, committing to the whole 30 has helped me assess how certain foods make my body feel while also being able to embrace balance. Most of us have grown up eating processed foods and even the “healthier” food options we’ve been told to eat like low-fat yogurt, instant oatmeal, or veggie patties are still processed! So in reality, I don’t think most of us can say that we know how our bodies feel or function without certain foods if we’ve never eliminated them from our diet. That’s why I now believe that if your going to embrace the intuitive eating approach its also a great idea to start with the whole 30 challenge and then go from there. Aside from providing my body with true nourishment, I learned that I’ve been doing a lot of eating based on comfort and habit versus actual hunger. Undergoing the whole 30 has helped me become more in tune with certain foods and my body than ever before, which I love. Another benefit I’ve reaped from the whole 30 is more sustained energy throughout my day. Eating whole foods like vegetables, fruit, and way more fat and meat than I typically have, has helped me get rid of the dreaded afternoon slump. Lastly, I realized that as much as I like to promote balanced eating there were a lot of foods that I would barely touch because of the dietary guidelines outlined from the Academy of Nutrition and Dietetics. Because of the whole 30 I did my own digging on fat and don’t necessarily believe it’s the culprit behind the health problems we face as a society as much as processed foods and added sugars are. Real talk— as healthy as I strive to be, taking on the whole 30 made me realize that a good portion of the foods I was eating are processed. On top of that, I have a sweet tooth like nobody’s business and I wasn’t exactly feeding my body optimally. I realized my favorite type of added sugar (aside from cookies and ice cream) was mixed with caffeine in the form of a pre-workout, latte, or energy drink. One way I was able to cut back on caffeine was by adding fat to coffee (1 tbsp. of ghee and 1 tbsp. of MCT oil). Full disclosure— I was against this in the past but after trying it for myself and realizing a huge difference (I’m not kidding–seriously night and day) this may be a helpful solution for you too. After the 30 days are over you decide how you want to nourish your body. You’ll slowly integrate the avoided foods back into your diet to see how you feel. You kinda have to because whole foods don’t have a shelf life like the processed stuff we’re used to! In reality, the whole 30 is only 30 days and after learning about the science behind the program tied in with the real life testimonials, I’d be surprised if you didn’t want to give it a go! great post! always wanted to try that!